Diana takes inspiration from her mother’s Sunday tea and serves a light Swiss roll filled with homemade lemon curd. For the lemon curd, put the butter, sugar, lemon zest and juice into a bowl set over a saucepan of simmering water (ensure the bowl does not touch the water). Stir occasionally until the sugar is dissolved. When the sugar is dissolved, add the beaten eggs and continue to heat, stirring occasionally, until the mixture thickens. Transfer to a bowl to cool. For the sponge, preheat the oven to 200C/400F/Gas 6. Grease and line a 26x40cm/10½x16in baking tray with baking parchment. Place a large heatproof bowl over a pan of simmering water. Add the eggs and sugar to the bowl and whisk until lukewarm (don't overheat the mixture). Remove bowl and whisk until the mixture is very thick and leaves trails when the whisk is removed. Fold in the sifted flour using a metal spoon. Spread the mixture onto the prepared baking tray and place on the middle shelf in the oven. Bake for 8-10 minutes, or until firm to the touch. Lay a large piece of greaseproof paper or a tea towel on the work surface and dust with sugar. Tip out the cake onto the dusted paper/tea towel and carefully remove the baking parchment. Spread the, still warm, lemon curd evenly over the sponge. Position the cake with one of the short ends nearest to you. Make a cut across the width of the sponge about 1cm/½in in and about three-quarters of the way through the depth of the sponge (this will help you roll up the sponge). Tightly roll up the sponge starting at the nearest edge and using the paper/tea towel to help you. Set aside to cool. 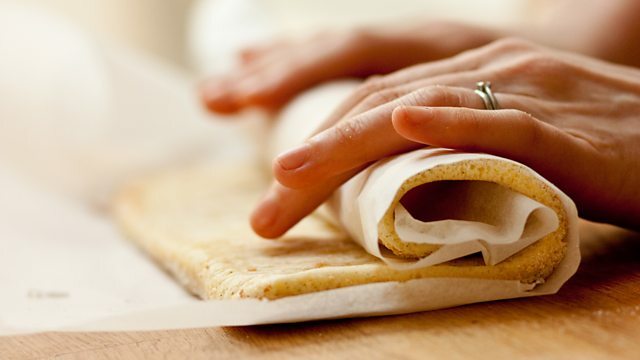 Before serving, trim the ends of the roll to create a neat finish and dust with a little extra sugar, if desired. Any leftover lemon curd can be stored in an airtight container in the fridge for up to a week.